Lagos is a place of extremes. The coastal, southern Nigerian city is the most populous in Africa with more than 21 million inhabitants. Although most Lagosians struggle to make ends meet and live in informal settlements, commonly referred to as ‘slums’, the city is also home to more than 60% of the country’s millionaires. Built on a lagoon (its name derives from the Portuguese for lake) land in Lagos is a precious commodity. As demand for real estate grows, areas of the city are undergoing an extreme form of gentrification. In Lekki island, land values are rising, as Lagos resident Folayemi Brown told TWW “Lekki is cheaper than neighbouring Victoria Island - the banking / clubbing district - and Ikoyi, where old money families live.” With the young and new monied seeking homes with a sea view, waterfront communities are finding themselves in a perilous position. The destruction made more than 4,700 people homeless. According to Megan Chapman, founder of the Justice & Empower Initiatives (JEI), a Lagos-based NGO seeking to empower the urban poor, one resident was shot and another stabbed. Otodo-Gbame has been occupied for over 200 years by descendants of the Egun, a fishing people from Badagry, a coastal town west of Lagos. Ms. Chapman told The World Weekly that “the community had lived peacefully side-by-side with its neighbours” for decades. However, since a violent attack in 2014 the community’s status has been in jeopardy. JEI blamed factions related to the Elegushi family, a dynasty of landowners with links to the Nigerian state which has a disputed claim on the waterfront area. The city legislature has absolved the family of any wrongdoing. After the 2014 attack and a declaration by the state government that it would demolish all waterfront shanties in the city, JEI went to court on behalf of 15 slum communities. On November 7 2016 the Lagos High Court issued an injunction against demolishing waterfront communities. 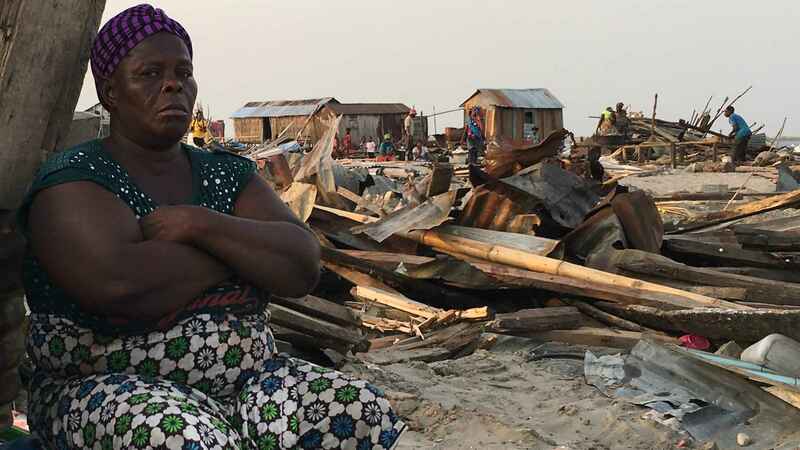 However, only a few days after the injunction, 30,000 residents of Otodo-Gbame had to flee when a fire swept through the community. Following the flames were police and bulldozers who continued to demolish thousands of homes. In January 2017 a landmark victory was achieved when the Lagos High Court issued an interim ruling that these evictions were “cruel, inhuman and degrading” and in violation of the 1999 constitution. The interim ruled that affected communities must be sought out for dialogue before any clearances can take place. It also stated that before any eviction residents must be given notice and, most importantly, be provided with alternative shelter. All this was ignored this week; no notice or alternative shelter was provided when excavators, under contract from the Lagos government and accompanied by the Lagos state task force, arrived to demolish the remaining homes in Otodo-Gbame. Residents staged a peaceful protest on Wednesday, successfully fending off a swamp buggy equipped to work in water. 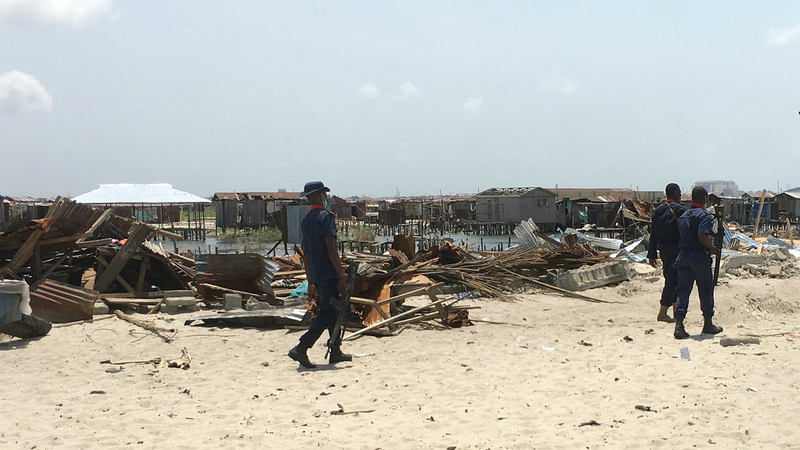 But it was a small victory, and most of Otodo-Gbame now lies in ruins: children huddle with their mothers under pieces of corrugated iron salvaged from what was left of their homes. Akinwunmi Ambode, the governor of Lagos state, issued a statement claiming that the forced eviction was “in the interest of the public”. TWW reached out to Mr. Ambode’s office for comment, but had not received a reply as it went to press. Slum clearances are nothing new to poor Lagosians. In his novel ‘Graceland’, set in 1983, Chris Abani describes how residents of the now vanished Makoko slum tried in vain to resist the “tyrannical wheels of the bulldozer”. Tom Angotti, professor of urban policy at City University of New York, told TWW it “is hard to believe that governments all over the world today continue to portray many communities in large cities as ‘slums’ that have to be torn up and replaced”. The most recent demolitions go hand in hand with the state government’s pledge to transform Lagos into a modern mega-city. But the so-called slums, as Professor Angotti explains, “are mostly self-built communities that have worked, often for generations, to build their own housing and infrastructure and improve their own living conditions”. Edgar Pieterse, from the African Centre for Cities, put it differently: “The shanty city is by and large the real African city”.